A lightened up version of a traditional “fool” dessert. 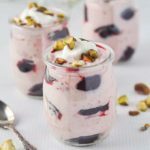 This Cherry Yogurt Coconut Fool mini dessert is made with fresh or frozen cherries and Greek yogurt. 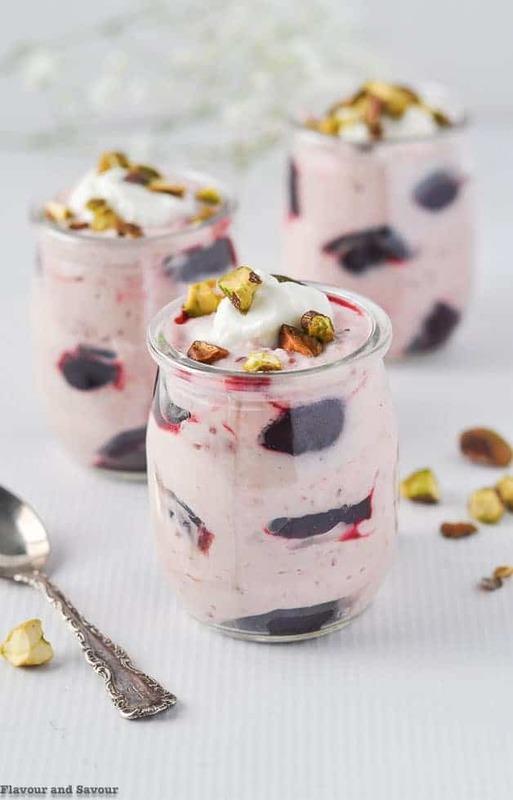 Mini desserts like this Light Cherry Coconut Yogurt Fool are often all we want after a big meal. This no-bake easy dessert is lightly sweetened with your choice of sweetener. Cherries add a delicate colour and natural sweetness. Pretty in pink! This mini dessert is ideal for any time of the year. When fresh cherries are available, it’s a great way to celebrate cherry season! Frozen cherries are available year round and they’re already pitted! 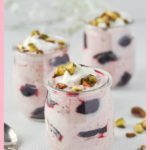 This Cherry Coconut Yogurt Fool is perfect for a date night dessert at home, for Valentine’s Day, Christmas, or any time you want a light healthy dessert. A “fool” dessert is made by folding puréed fruit into either a sweet custard or whipped cream. I have a delicious recipe for an easy Raspberry Rhubarb Fool here on the blog that you might like. Today, however, I lightened this traditional English dessert by substituting plain Greek yogurt for the whipping cream. 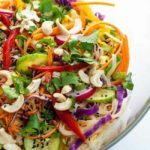 While you can use the sweetener of your choice, I used zero-calorie Monkfruit with erythritol in this recipe. Since cherries and almond flavours go hand-in-hand, I added a tiny bit of pure almond extract to the mix. To add some contrast in texture and taste, I topped the dessert glasses with chopped salted pistachios. Flaked almonds are also delicious, however, and they complement the cherry-almond flavour of this mini cherry dessert. 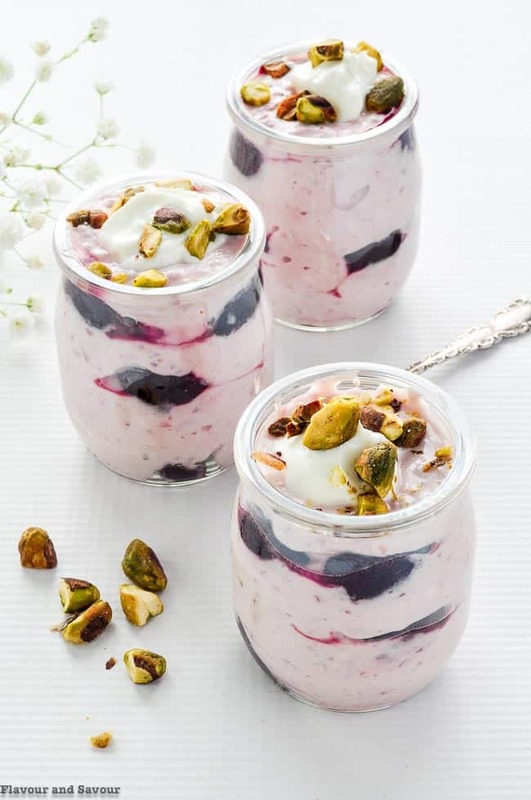 Greek yogurt: use a very firm variety, the kind you can stand a spoon up in. I used 2%. coconut: medium unsweetened. It’s optional if you don’t like coconut. sweetener: zero-calorie sweetener (Monkfruit with erythritol is my favourite), Swerve, sugar or honey. cherries: pitted fresh or frozen. You’ll purée 1/4 cup in a blender and halve an additional 1/2 cup to fold in. 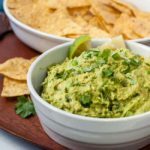 roasted salted pistachios: coarsely chop to add a little salty interest, or substitute flaked almonds if you don’t have pistachios. 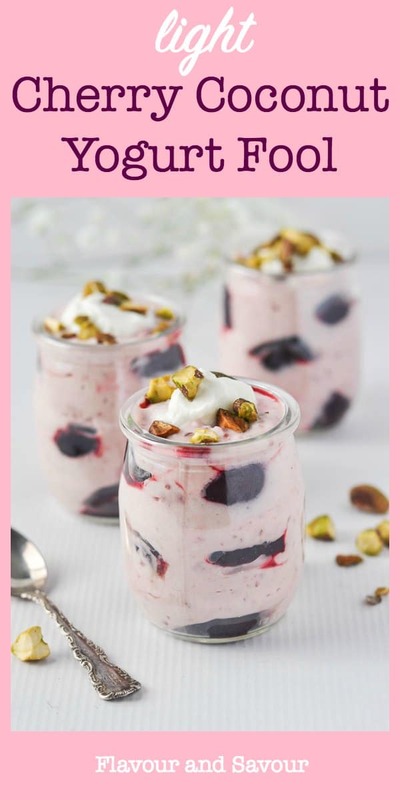 To make this easy mini dessert, simply combine yogurt, coconut, sweetener, puréed cherries and almond extract in a small bowl. 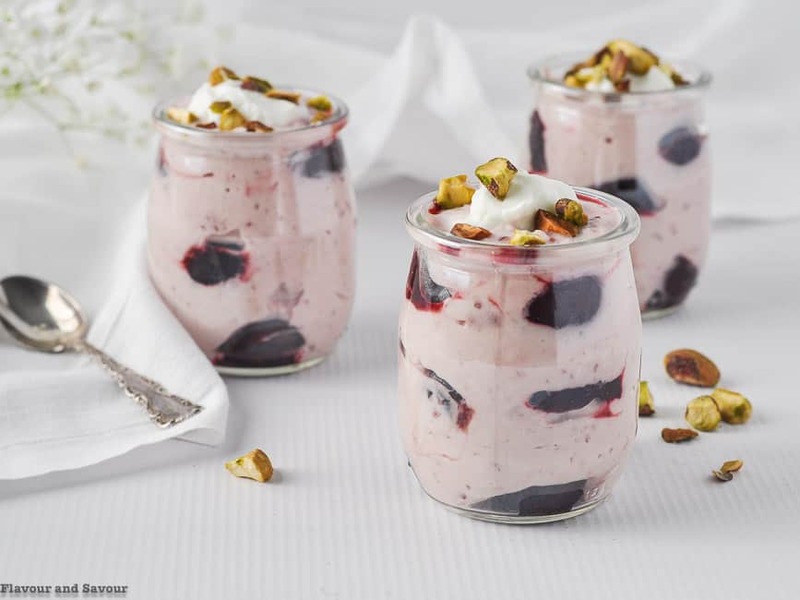 Gently fold in the halved cherries, fill dessert cups and garnish with a small dollop of yogurt and chopped nuts. If you’re not serving on the same day, add the nuts just before serving so they don’t become soggy. To make this dessert richer, you could substitute 1/4 to 1/2 of the yogurt with whipping cream. I hope you like it as much as we do! If you make it, let me know in the comments below. 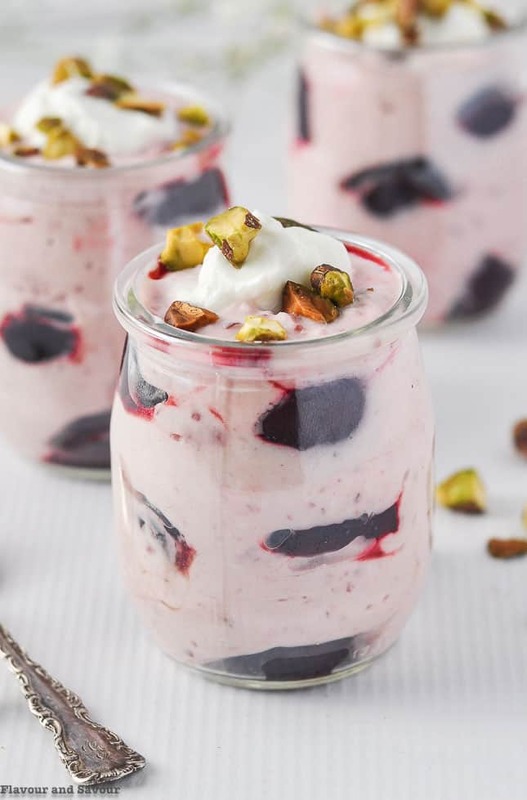 Combine Greek yogurt, coconut, sweetener, puréed cherries and almond extract in a small bowl. Gently fold in halve cherries. Spoon into 4 mini dessert cups. 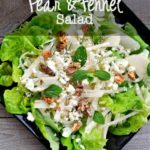 Garnish with salted pistachios or flaked almonds. Chill until serving time. What a pretty, light dessert – perfect for Valentine’s Day! I agree that cherry and almond are a perfect combination! 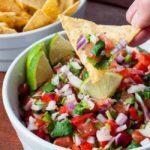 My husband loves cherries, so I’m Pinning this recipe. mmm. . . . this looks yummy, and would be a perfect light dessert after a meal. Thanks so much, Sheryl! Agreed, sometimes we just want a “taste” and don’t need a big dessert. These mini desserts are perfect for those times! Thanks for commenting! I love cherry desserts and pairing them with almond extract is a nice touch! This is a perfect lightened up dessert to enjoy for Valentines! Pretty too! Pinned! Thanks Leanne. Now that I’ve discovered frozen cherries, I’m on a roll with cherry desserts! 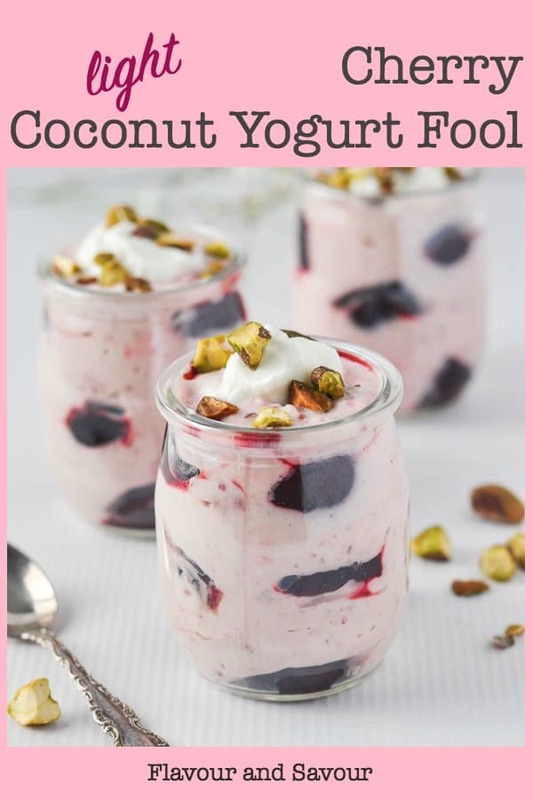 What a fabulous light dessert…it would be stunning with coconut yoghurt for a vegan option. Wish I had one of these right now! This looks like the perfect Valentine’s Day treat! Or any day treat really! Gorgeous! Thanks Wanda, It’s an easy one to make quickly, even for a weekday dessert! I have everything to make this gorgeous dessert, Elaine! 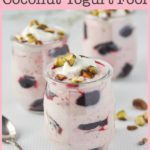 I am delighted to see your lovely recipe for Light Cherry Yogurt Coconut Fool. My grandchildren are gluten-free and dairy-free. I know that they will love it! Many thanks for sharing.